Dacia Logan Pick-Up engine oil capacity in quarts – liters. From year: 2004, 2005, 2006, 2007, 2008, 2009, 2010, 2011, 2012, 2013, 2014. How many quarts / liters of engine oil is needed for an oil change including replacement of oil filter for a Dacia Logan. Dacia Logan Pick-Up 1.2 16V, engine oil capacity in quarts / liters. Dacia Logan Pick-Up with engine 1.2 l, it is a cargo cars. Dacia Logan Pick-Up engine code: D4F 732/734. Dacia Logan Pick-Up engine oil capacity liters: 4 l.
Dacia Logan Pick-Up manual gearbox oil capacity. Dacia Logan Pick-Up automatic gearbox oil capacity. Dacia Logan Pick-Up recommended engine oil: A.Z. Meis MT 7 5w-40, Castrol 5w-40 Magnatec, Mobil 1 Super 2000, Mobil 1 Super 3000, Liqyu Moly Toptec 4100 5w-40, Liqyu Moly Toptec 4200 5w-30. 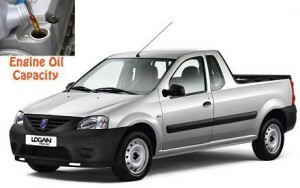 Dacia Logan Pick-Up 1.4 l, engine oil capacity in quarts / liters. Dacia Logan Pick-Up with engine 1.4 l, it is a cargo cars. Dacia Logan Pick-Up engine code: K7J 710/714. Dacia Logan Pick-Up engine oil capacity liters: 3.3 l.
Dacia Logan Pick-Up manual gearbox oil capacity: 3.1 l.
Dacia Logan Pick-Up 1.5 dCi, engine oil capacity in quarts / liters. Dacia Logan Pick-Up with engine 1.5 l, it is a cargo cars. Dacia Logan Pick-Up engine code: K9K 790/792, K9K 892, K9K 796, K9K 892. Dacia Logan Pick-Up engine oil capacity liters: 4.5 l.
Dacia Logan Pick-Up engine oil capacity liters: 3.3 l for engine code K9K 796. Dacia Logan Pick-Up manual gearbox oil capacity: 2.8 l.
Dacia Logan Pick-Up recommended engine oil: A.Z. Meist MT-7D 5w-40, Castrol 10w-40 Magnatec Diesel, Castrol 5w-40 Magnatec Diesel, Liqyu Moly Leichtlauf Diesel 10w-40, Diesel, Mobil 1 Super 2000 X1 Diesel 10w-40, Mobil 1 Super 3000 XE Diesel 5w-30. Dacia Logan Pick-Up 1.6 16V, engine oil capacity in quarts / liters. Dacia Logan Pick-Up with engine 1.6 l, it is a cargo cars. Dacia Logan Pick-Up engine code: K7M 800/718, K7M710, K4M 690/696. Dacia Logan Pick-Up engine oil capacity liters: 3.3 l for engine code K7M 800/718, K7M710. Dacia Logan Pick-Up engine oil capacity liters:4.8 l for engine code K4M 690/696. LPG significantly reduces the emission of pollutants and helps in the fight against global warming thanks to its low CO2 emissions. It is both ecological and economical. Available at more than 32,000 filling stations in Europe, it is currently the least expensive fuel on the market and offers considerable tax advantages. More flexible to drive, less frequent oil changes, longer engine life… it protects and preserves your vehicle while providing you with autonomy, versatility and driving pleasure. All information about engine oil capacity or gear box oil capacity is taken from Dacia Logan Pick-Up owners manual.